One of the first Lucasia-raised Percherons to be shown widely and successfully was Lucasia Big John. 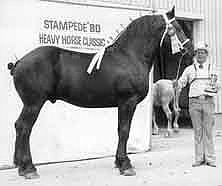 In 1976, he won three Grand Championships and two Supreme Percheron trophies in Alberta. That fall he went on to be named Grand Champion Stallion at the Toronto Royal Winter Fair. Big John's sire, the renowned Justimere Showtime also sired a half brother out of the mare Drake Farms Ann. This Stallion was Lucasia Sir William; he was perennially at the top of his class for the few short years he lived. The progeny of these horses has allowed Lucasia Ranches to show quality Percherons for many years. Lucasia held production sales in 1983, 1986 and 1998. Wayne and Judy had a Percheron dispersal sale in High River, AB but the need to keep Percherons in their lives was too great. The small herd of Lucasia Percherons is slowly growing and more and more frequently of late; Lucasia horses are finding their way to the show ring!